Technology: Honing Services are abrasive metal finishing techniques similar to grinding that are used to improve the shapes of round and cylindrical parts and especially internal diameters. Honing can be done using manual tools or specialized machinery. It is common in engine rebuilding where the cylinders are honed to improve cylindricity and surface finish. Seamless tubing is sometimes honed to bring the internal diameter to a closely toleranced dimension. Honing, if required, is usually the final stage in the machining process. 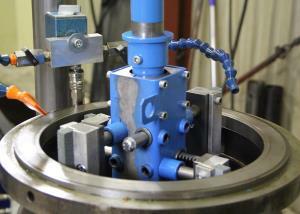 Advantages: Honing Services offer an alternative to boring and internal grinding. Applications: Honing services are appropriate alternatives to producing critical inside diameters and geometries particularly on large equipment that is difficult to transport.